Update: The three eggs hatched and the eyases fledged June 16th, June 19th, and June 21th. Update: A third egg was laid on March 30th. With the laying of two eggs in the Washington Square Park Red-tailed Hawk nest, now seems like a good time to share a nesting profile of the species and particulars about the park's resident hawks. Red-tailed Hawks lay one brood or set of eggs each season. The number of eggs in the brood ranges from one to five. The WSP hawks have laid between two and three eggs annually since 2011. Red-tailed Hawks are monogamous, mating for life. The male hawk (named Bobby) has not changed since the mating pair formed, but there have been three female hawks. Violet, the first female hawk, laid three eggs in 2011 but only one survived to be named Pip. (Pip is an ornithological term referring to the hole in the egg made by the hatchling's egg tooth.) Violet died at the end of 2011. During her rehabilitation off the nest, a female hawk, eventually named Rosie, arrived in the territory and paired up with Bobby. Rosie laid two eggs in 2012. The eggs hatched and fledging was successful. In 2013, she laid three eggs and all of them hatched. Rosie laid two eggs in 2014 both of which hatched. Rosie left the territory in the fall of that year. By February of 2015, Bobby had a new mate, Sadie/Aurora. The pair incubated three eggs but only two hatched and fledged. Sadie again laid three eggs in 2016. However, only one hatched. That chick fledged in June. 2017 marked the third consecutive year that Sadie laid three eggs. Despite successfully incubating two of the three eggs, one of the hatchlings died. The third egg never hatched. 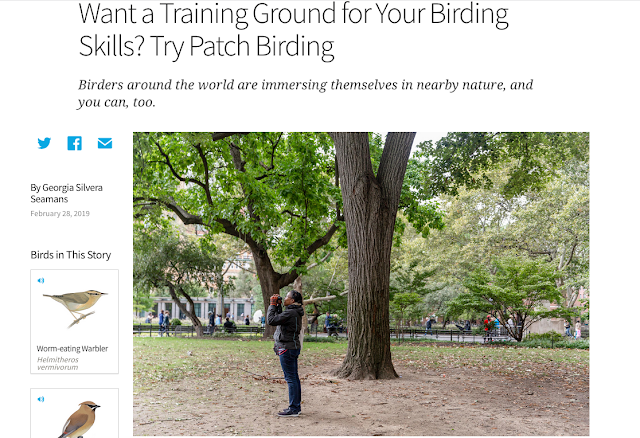 It's safe to say that hawk watchers are delighted by and anxious about this nesting cycle. The dates and numbers provided so far were gleaned from posts on the Roger_Paw blog. Here's the information in table form so it's easier to visualize. The male and female hawks share nest-building duties. The male also participates in incubating the eggs but this task is mostly done by the female hawk. Incubation begins with the first egg and lasts anywhere from 28 to 35 days. Chicks are nestled for a period of up to 46 days. The traditional location of a Red-tailed Hawk's is in a tall tree with a fairly sweeping view of the surrounding landscape. Red-tailed Hawks also nest on cliff ledges and on human-made structures such as window ledges. 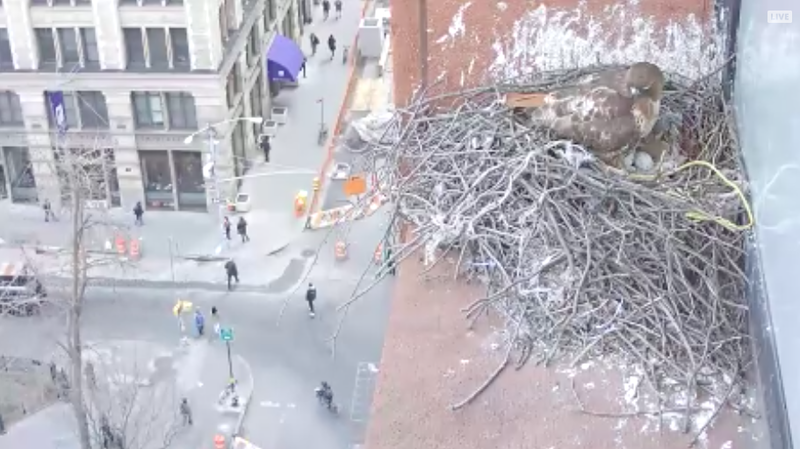 In the case of the Washington Square Park Red-tailed Hawks, the nest is on a ledge of the Bobst NYU Library. The ledge is quite deep and affords a view of the almost 10-acre park. Within the hawks' territory are many tall buildings that provide advantageous perches. The hawks have used the same nest each season which is typical of this species. They repair it annually. I have seen them collecting and arranging nesting material. The nest extends beyond the width of the window ledge; you can see it if you look up while standing on West Fourth Street. Will the female hawk lay another egg this season? To see the nest happenings, watch the hawk cam. Nest information provided in this post sourced from All About Birds here and here. I love reading this, and what a heartening adaption these hawks have made in the urban setting. We have Peregrine falcons nesting much like the redtails, although without the nest building (they are more "substrate" nesters on ledges). Our more common raptors in Seattle are Merlins and Coopers Hawks, both which borrow old crows nests for their baby rearing. There had been a Cooper's visiting the park. Your comment reminds me that I haven't seen it in awhile. The provision of a suitable nesting site is a redeeming quality of the library building!